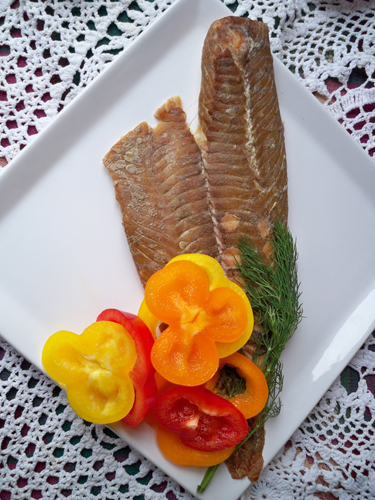 About Us And Smoked Salmon! MAINE-LY SMOKED SALMON is located just minutes away from the Passamaquoddy Bay, where salmon are farm raised and harvested daily in accordance with the most rigid FDA and Maine state regulations and HACCP certification. We ship FedEx delivery direct from our facilities to your door to assure you receiving the freshest product possible. MAINE-LY SMOKED SALMON is a family owned and operated business. John and Karen Constant have over 35 years of salmon processing experience under their belt. As John will tell you, "My life, for the most part, has been built around salmon, 18 years with another firm, the last seventeen with my own business. 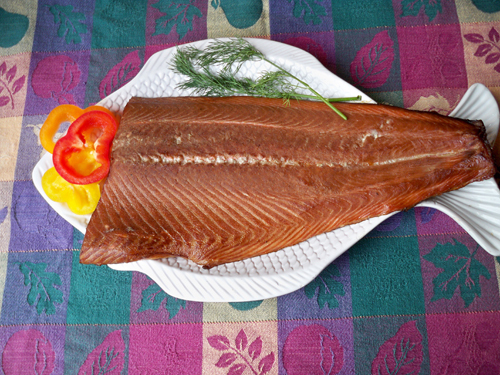 Our smoked salmon is fresh Grade-A farm-raised Atlantic salmon. All natural steps are taken to produce a golden brown, boneless product that is so full of flavor, you'll keep coming back for more. There's nothing artificial, no preservatives are used... just good, 'Downeast' boneless, wild apple wood smoked salmon. Our smoking and handling process is explained here. . .